So, I have finally finished part one of The Lord of the Rings! I am completely blown away by the depth of the world-building. This reads more like a historical narrative than a story set in a made-up world. The level of detail and the different languages and cultures within the world feel real. I think this is one of the main strengths of this book for me - it makes me want to discover more about this world, and it feels like really it is only scratching the surface in this book. Some of the descriptive passages are also beautiful. 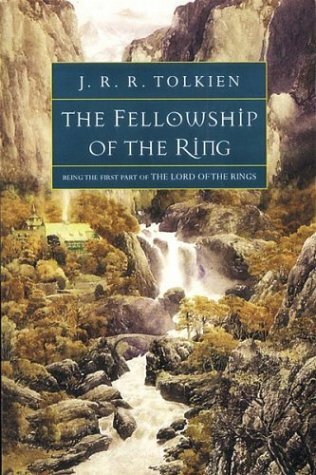 I rather enjoyed most of the songs and poems as well, and felt that they added to the authenticity of the world, as many of them tell legends and well-known stories within Middle-Earth. As for the story itself, I have to admit that I found it rather slow going at times; there were sections where really not a lot happened. So that did make it a little hard to get through at times. The pace did pick up a bit as the story progressed, and I'm expecting it to be a lot quicker in the remaining two books. I also found it quite difficult to keep track of all the people and place names, let alone their legends and traditions. I think it is a book I would appreciate more on rereading. All in all, I enjoyed reading this book, although sometimes it was more of an awed, appreciating enjoyment than anything else. I'm looking forward to reading the rest of the trilogy, and hope to reread this someday too. Thanks :) I'm looking forward to starting The Two Towers soon!